Not Ho-Hum-mus! 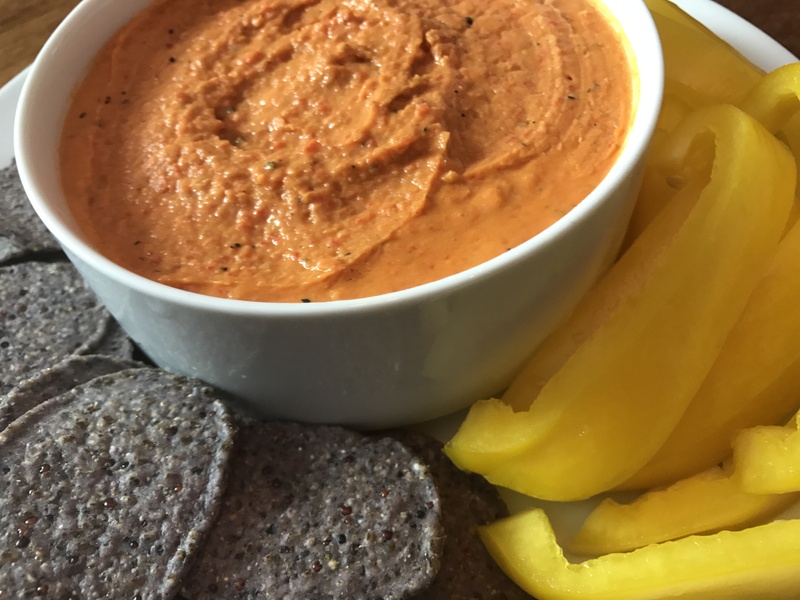 Roasted Red Pepper White Bean Hummus! It’s already the unofficial “end” of summer – Labor Day weekend. 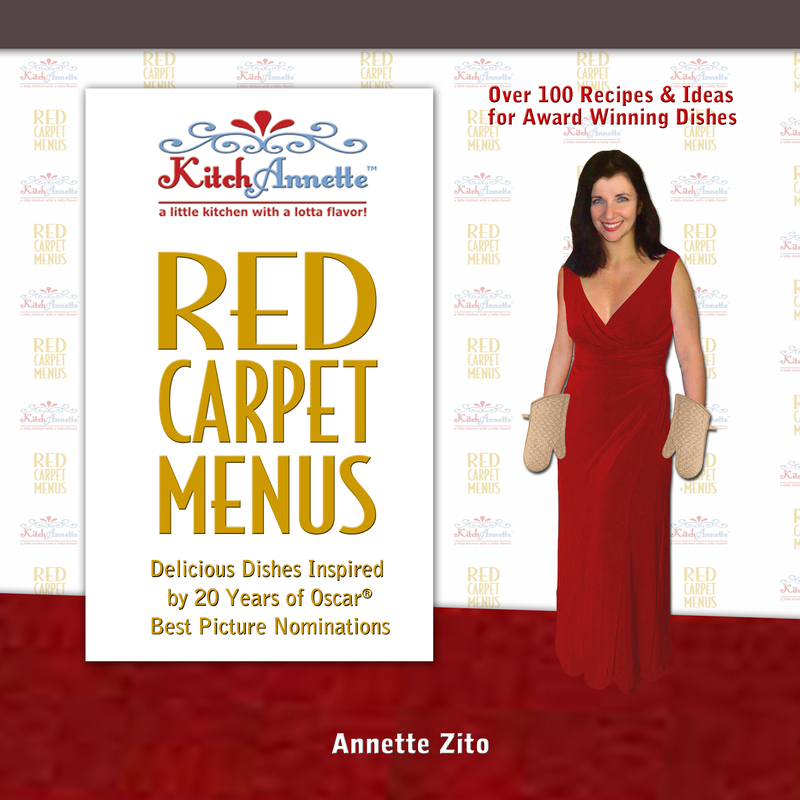 Parties, picnics, outdoor dishing! Last hurrahs! Well, seriously… summer has a few weeks more so let’s not totally bemoan it’s end. Ha! The last thing anyone wants to do on Labor Day weekend is any LABOR. Being someone who is a fan of year-round “economy of effort”, I wouldn’t provide you with a recipe that wasn’t a snap. And also, I wouldn’t give you a “ho-hum” sorta dish – gotta give it some verve… some razzmatazz! Holiday weekend-worthy! This hummus is IT! 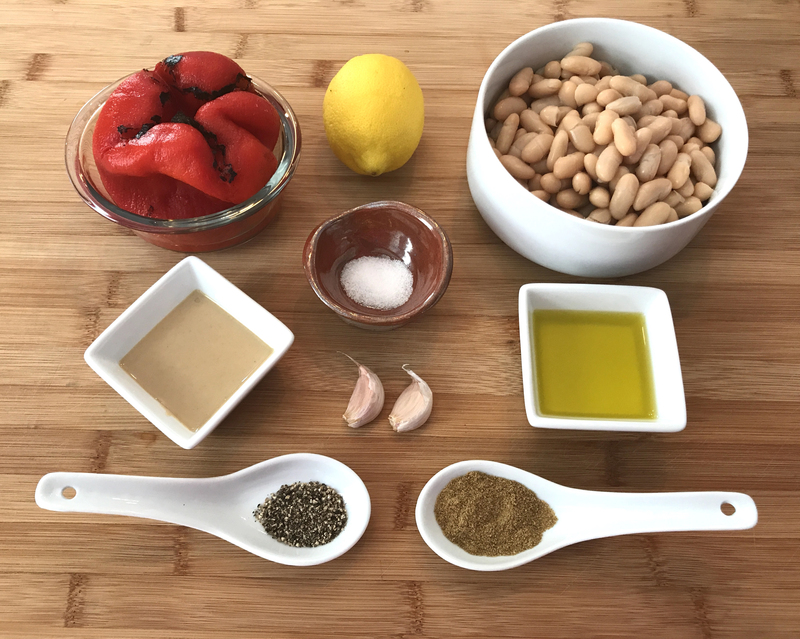 Of course hummus is most often made with garbanzo beans/chick peas but there are no rules! One of my favorite beans is smooth cannellini, or white kidney beans and I like their nutritional value better than chick peas. 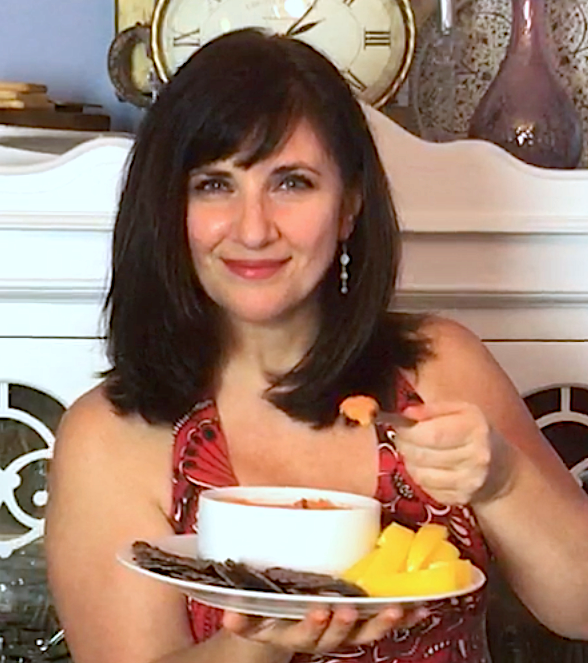 If you’ve not indulged in roasted red peppers, you are missing OUT! They are great in salads, as an extravagant selection on a well-appointed antipasto platter, and on a good sandwich with grilled chicken with fresh mozzarella. Yummmmm! Of COURSE they’d be divine in this hummus. OK – let’s get to it! This takes no time to put together. I don’t expect you to roast your own pepper – but please do if you have the grill on anyway. Ha! 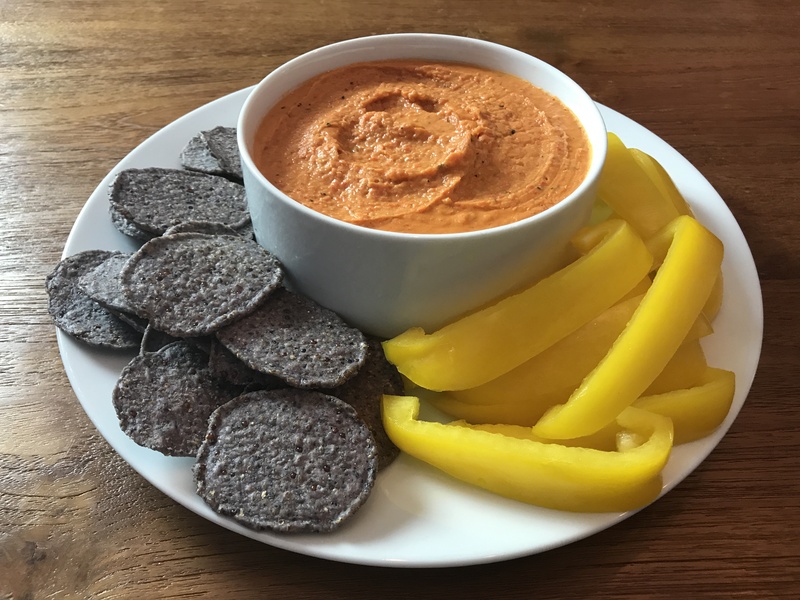 I sliced up yellow bell peppers to increase the good pepper flavor but also got great chips at Trader Joe’s – their organic blue corn tortilla chips with sprouted amaranth, quinoia, and chia seeds. 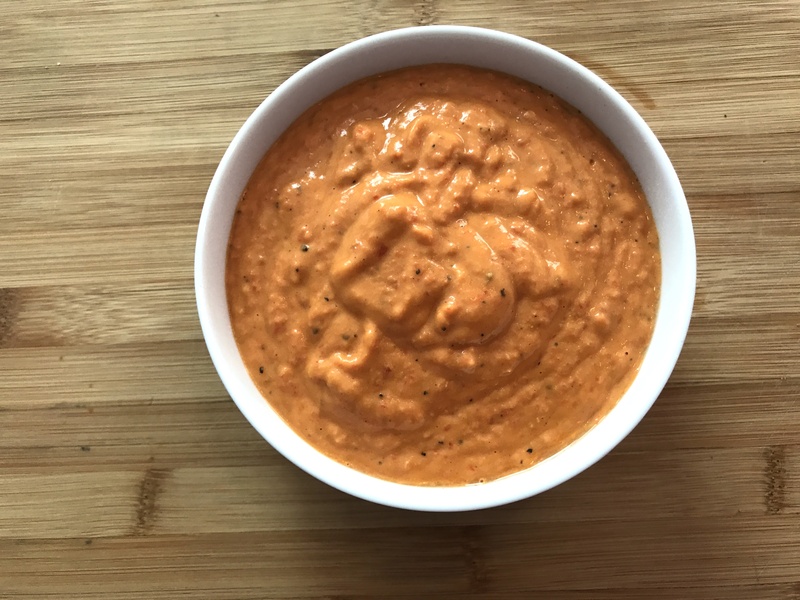 A nice hearty chip for a robust and smooth hummus dip! Happy Labor Day weekend! Remember you have until Friday, September 22nd to say “So long” to summer! Add all ingredients EXCEPT oil to a blender or food processor and blend well. Add oil and blend until smooth. « We’re Coco for Brazilian Coconut Kisses with Dark Chocolate!